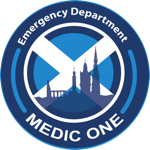 Edinburgh Emergency Medicine - Pain of the Soul? It’s 7pm in the Emergency Department on a Thursday evening, and the late afternoon / early evening rush is in full swing. The “hum” that comes with a busy ED is in the air – the white noise of multiple patients in distress, the heat of dense humanity, the smells of spilled blood and vomit – it is a visceral sensation that many people find very disconcerting (including many Doctors). This is our normal working environment, and one that usually provokes us to speak quietly and behave calmly to reduce any amplification of this sensory overload, which often surprises folks who are expecting Hollywood “shouty” medicine. Jim is not Hollywood. He is lying on a trolley in our Majors area, and is groaning with pain clutching his chest. He is in his 60’s, looks like he is at least 80, and is dishevelled, frail and broken. As part of our initial triage and assessment process, Jim has had a heart tracing performed and checked, and it looks reassuring at the moment. This early brief meeting also gives us a chance to review Jim’s history and previous attendances. This is Jim’s 54th attendance to ED in the last 12 months, and his 3rd this week. This is by no means a record at the Royal Infirmary for patient attendances, but it is characteristic of a small group of individuals who are known by sight and on first name terms to many of our staff. With the natural sense of sadness and frustration that these individuals can provoke on attending so frequently, it can be easy to overlook how sad and frustrating it must also be for the patients. Indeed, when you meet some of these patients out with their moments of crisis, it can be quite disconcerting how “normal” they are. It is a reminder that our perspective on patients’ lives is particularly warped when all we see of them is in the middle of them unravelling. Jim always presents with chest pain. His normal pattern is that he drinks heavily, and during his inebriation he will present to the ED with central severe chest pain. In response to this we will go to varying lengths to ensure that there is no obviously medical cause for his chest pain like an heart attack, pneumonia, blood clot in the lung, collapsed lung, or other such significant medical condition, and then discharge him from hospital with reassurance. Some people may argue that this is an inappropriate use of scarce NHS resources. However Jim, due to his lifestyle choices, frailty, and previous medical conditions, is actually more likely to have a life-threatening condition than many other patients his age, and the fact that he presents frequently only makes him more likely to have something seriously wrong. Teasing out the presentation where that may be the case can be like looking for a needle in the haystack, and this is a role that is part of our core skills as Emergency Physicians. But Jim’s case also highlights that many crisis presentations to our ED are not necessarily driven by medical conditions. Jim articulates his situation in a beautifully frank way: he was out drinking after taking ownership of his new council flat, and developed the severe pain in his chest as he would do normally. He now lives in a new residence on his own, and essentially has no social support. He was worried, alone, and wanted to feel reassured. I think of it as pain of the soul, the modern symptom of social isolation and loneliness that affects our ability to cope with chronic conditions and crises, especially in our more elderly population. Community support has been evaporated in the heat of modern living. For me, along with our other epidemic of under-exercise and obesity-related illness, this is one of the pre-eminent challenges to our healthcare system. Both require non-healthcare solutions, which is what makes them so challenging to address. Having examined Jim and heard his story, compared it to previous accounts of similar presentations, and done a simple heart tracing, I am as sure as I need to be that this requires nothing further from a medical point of view, just healthy lashings of reassurance and the ubiquitous medicine of a cup of tea. This might save Jim the requirement of an admission to hospital for further tests, but will not reduce the likelihood of future attendances. To achieve that, we need to be able to influence some of the social factors that surround Jim. In Lothian, we have benefitted from an investment in our PACT team – the Patient experience and Anticipatory Care Team. This group of nurses, doctors, and liaison workers seek out patients who attend on multiple occasions and see them to work through the reasons why they attend the ED, instituting care plans and non-medical therapies to help patients manage their long-term conditions in a more controlled way. This has already shown a return on the initial investment proportionate to £6 for every £1 spent, and must have many benefits to patients’ burden of illness. Encouraging a society where we are all prepared to look out for each other and remain connected on a human level may take longer to achieve.